A new Rockstar "Asked & Answered" reveals that Max Payne 3 may be a little closer to the original games than previously expected. 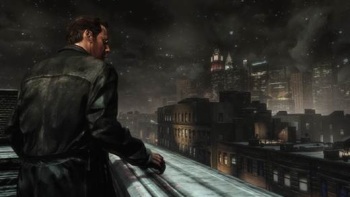 When I think Max Payne, I think of a broken cop in a bad shirt and a cool jacket, struggling desperately from day to day in the cold, uncaring streets of New York City. But things are different in Max Payne 3; Max is now an older, thicker gun for hire with a shaved head and a wifebeater, plying his trade in the slums of Sao Paulo. Everything has changed. Or has it? While most of the pre-release coverage has focused on the physically and geographically transformed Max, a good number of images featuring "classic" Max in his traditional NYC stomping grounds have also come to light. Is it possible that we'll get to spend more time with the old Max than we thought? "We don't want to give too much away about the game's narrative structure, but the game is about Max coming to terms with his experience in SÃ£o Paulo and the events that took him there, so [the New York City segments] are spread throughout the game, like memories triggered by events in SÃ£o Paulo," Rockstar wrote in the latest "Asked & Answered." And like the first two games, Max Payne 3 will be as nasty as you wanna be - in terms of difficulty, at least. "There will indeed be varying optional difficulty levels for players to play through the single-player story with," it explained, "so that the game can be a challenging, satisfying, and fun experience for players of all skill levels, and special rewards for completing on harder difficulty levels." Most of the answers are pretty thin on details, but the more I see, the happier I am. This might just be the real deal after all. Max Payne 3 comes out on May 15 for the Xbox 360 and PlayStation 3, and May 29 for the PC.